Andrew (GDC 115394) joined our team in October 2014. He was born and raised in Caerphilly, South Wales and at school he represented Wales through swimming. He studied dentistry at the University of Cardiff, graduating with honours. He completed his vocational training in Plymouth, distinguishing himself by gaining an award for the best case presentation. 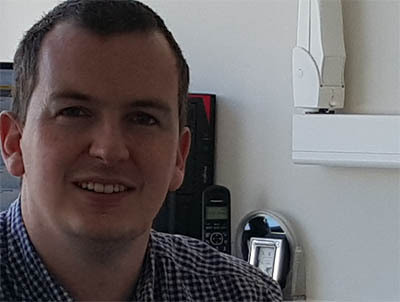 Andrew then spent a year as a Maxillofacial Senior House Officer (SHO) at Derriford Hospital where his duties included emergencies on A&E, head and neck surgery and wisdom tooth removal. He has developed his interest in Orthodontics and is qualified to offer Quick Straight Teeth short term orthodonics. In September 2017 Andrew completed the ITI Foundation in Implant Dentistry with Straumann and was interviewed by The Revu about the course. Andrew is married with a young daughter and cocker spaniel and is a keen Wales rugby fan! In addition he has extended his earlier water based activities into sailing, completing the RNLI Day Skipper qualification. On land he has competed in the Speedmog Hill Climb at Shelsley Walsh (and other venues)!